Domino has announced the launch of its latest Diamond Ring Mount (DRM) collection. This highly. Nicolle Gavin, a 2017 graduate in Jewellery & Silversmithing from Glasgow School of Art, has. Leading premium packaging partner Talbots is enjoying a double success having been announced as finalists. London based designer Isabella Liu won the International Jewellery London (IJL) Editor’s Choice award for. The Company of Master Jewellers (CMJ) has approved Midlands-based independent retail jeweller GL Bicknell &. Due to popular demand, leading premium jewellery packaging partner, Talbots, has this month grown their. The signet ring is back. But move over the traditional buyers and enter the Millennials;. Domino has reported strong interest in its UK-made wedding and engagement rings at this year’s. Weston Beamor, the Birmingham Casting house, 3D printing and bespoke manufacturing company has recently been. This year’s Baselworld (March 23-30 2017) is an exciting one for British cufflink manufacturers, Deakin. Following its launch in February, Domino Jewellery has reported strong and positive feedback from retailers. A fusion of organic fresh tones brings Deakin & Francis’s new ‘Summer Haze Cufflink Collection’. The Goldsmiths’ Craft & Design Council has concluded three weeks of successful judging for its. Leading jewellery industry packaging partner and local Birmingham Jewellery Quarter business, Talbots, has announced that. The Goldsmiths’ Craft & Design Council (GC&DC) has witnessed stellar ticket sales for its upcoming. 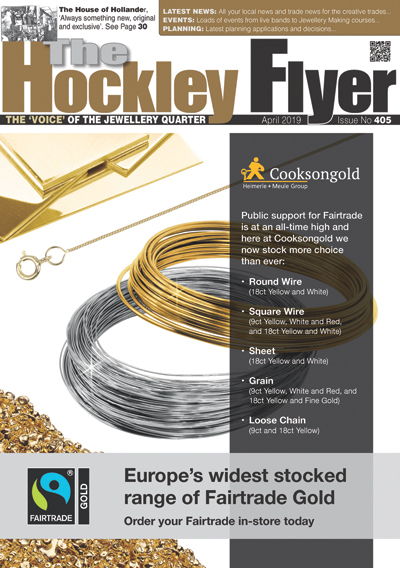 Birmingham-based jewellery manufacturer Hockley Mint will offer retailers the option to have wedding bands made. Weston Beamor, the Birmingham casting-house, 3D printing and bespoke jewellery manufacturing company, has recently been. The latest offering from designers and manufacturers, Deakin & Francis, are sure to knock your. Award-winning Birmingham-based jewellery manufacturer Hockley Mint has reported that streamlined internal processes and efficiencies have. Award-winning ethical jewellery brand Arctic Circle Diamonds has launched a boutique store on luxury jewellery. Domino has announced that from February 2017 all its platinum wedding bands will be created. Domino will use Jewellery & Watch Birmingham (Hall 17, Stand P38-Q39) to launch its new. December 1st saw the 81st British Jewellery Giftware & Finishing Federation Benevolent Society Ball take place. A thoughtful gift, a sentimental heirloom and a unique tie to Wales, Clogau’s Christmas collection. WB The Creative Jewellery Group was one of a select group of companies to be. Innovative packaging company Talbots Group has recently joined the National Association of Jewellers (NAJ) and. New LED Skull Cufflinks Are Frightfully Good! In time for Halloween, Deakin & Francis took their iconic skull cufflinks to the next. For autumn 2016 Domino has added ten new suites to its popular Belle Ile Collection..
On 1st and 2nd November, London’s Goldsmiths’ Hall will host the UK’s biggest careers event.